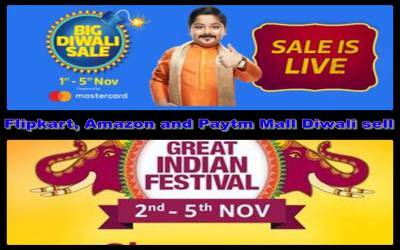 Flipkart, Amazon and Paytm Mall Diwali sell Best smartphone a look at the offers-There is a festival season, then you may even have the idea of buying something special in your mind. In such a way, the idea of buying a new smartphone is very common. Flipkart and Amazon are organizing their third cell in this festival season. Then, how Peti M is behind, the cashback offer on this e-commerce site has begun. These three have many offers on the website, in such a situation, when you go to search the deals you like, then Confucius is set. We have brought some select offers from Flipkart, Amazon and Petty Malls for your convenience. Honor 9N (4 GB, 64 GB)Honor 9 NK 4 GB RAM and 64 GB storage variant is being sold in Flipkart Big Diwali sale at Rs. 11,999 (MRP 15,999). Honor 9n has a 5.84 inch Full HD + (1080x2280 pixels) 2.5 de Curved Glass Display On this offer. Aspect ratio is 19: 9. Honor 9N runs on Android 8.0 Orio, which has been at the top of the EMUI 8.0. The handset has the Octa-core Kirin 659 chipset. If you exchange your old phone then you can get an extra discount of Rs 11,999. Moto Z2 Force (6 GB, 64 GB)The Moto Z2 Force 6 GB RAM and 64 GB storage variants are being sold at Rs. 19,999 (MRP 34,999). The phone has a 5.5-inch QHD (1440x2560 pixels) resolution shatter shield POLED display. The Qualcomm Snapdragon 835 processor is in the handset. 6 GB RAM has been provided for Jugalbandi. The dual camera (12 + 12 megapixel) is set up in the rear of the phone. In addition, a 5-megapixel camera sensor has been given at the front of the phone. An additional discount of Rs 14,900 is being given on the old phone exchange. Honor 10 (6 GB, 128GB)In the Flipkart Big Diwali Cell, the price of Honor 10 has been cut by up to 30%. This phone is available in Rs. 24,999 (MRP 35, 999). Honor 10 runs on the IMUI 8.1 based on the Android 8.1 Orio. The phone has a 5.84 inch Full HD + Full View display and The phone has an Octa-core Kerine 970 processor. Giving 6 GB RAM Speaking of the camera, there are dual rear cameras in Honor 10. It includes 24 + 16-megapixel sensors. Dual camera setup is named by the company - Artificial intelligence AI camera. Asus ZenFone Lite L1Asus's new budget smartphone ZenFone Lite L1 is being sold at Rs 5,999 (MRP 6,999). This price is for a limited time. Zenfone Light L1 has a 5-megapixel front camera for selfie and video calling, the archers are F / 2.2. The phone's 2 GB RAM / 16GB storage variant has been launched. the MicroSD card and it is possible to extend the storage to 256 GB. 3,000 mAh battery to make the phone fly. Up to 10 percent, additional discounts can be taken on using SBI card. Xiaomi Redmi Note 5 ProYou can buy the popular smartphone Redmi Note 5 Pro at Rs. 12,999 (MRP 14,999). This phone comes with 5.99-inch full-HD + display and Qualcomm Snapdragon 636 processor. 4 GB RAM is available. The Redmi Note 5 Pro has a dual rear camera setup and a 20-megapixel sensor is provided on the front panel. Exchanging old phones will get an extra discount of Rs 12,250. Realme 1 (6 GB, 128GB)The most powerful variant of Reality 1 is sold in the Amazon Great Indian Festive Sale at Rs 11,990 (MRP 14,990). The smartphone comes with a 6-inch full-HD display and MediaTek Helio P60 processor. There are 6 GB RAM for Jugalbandi. Realme 1 has a 13-megapixel rear camera, which comes with LED flash AND The front camera is of 8 megapixels. Honor 8X (4 GB, 64 GB)In Amazon cell, Honor 8X is being sold at Rs. 14,999 (MRP 17,999). Based on the Honor 8X EMUI 8.2.0, Android 8.1 runs on Orio. Honor 8X has 6.5 inch full HD + (1080x2340 pixels) TFT IPS display ON THIS MODEL. Its aspect ratio is 18.7: 9. Honor 8x For Speed and Multitasking, the Honor 8X has given options of 4 GB and 6 GB RAM with Highcilicon Kirin 710 processor. There will be a dual camera setup on the back, with the primary sensor of 20 megapixels and secondary sensor of 2 megapixels. Samsung Galaxy S9 + (6 GB, 256 GB)Samsung Galaxy S9 + 6 GB RAM and 256 GB storage model is available at 69,900 (MRP 79,000) in the Amazon Great Indian Festival cell. An additional 10,000 rupees discount is being given on old phone exchange. HDFC Bank Credit and Debit Card Users can get an additional 10% discount. Samsung Galaxy A8 + (6 GB, 64 GB)The Samsung Galaxy A8 + 6 GB RAM and 64 GB storage variant is available at Rs 23,990 (MRP 41,900). The phone is usually sold for 30,000 rupees. Exchanging old phones will get an additional discount of 18,854 rupees. The Galaxy A8+ has a 6-inch FullHD + AMOLED display and 3,500 mAh battery. The phone comes with a dual front camera setup. Vivo V9 ProThe Vivo V9 Pro market priced at Rs. 19,990 is being sold for Rs. 17,990. If you want, you can get an additional discount of Rs 16,191 by exchanging the old phone. The Vivo V9 Pro Out of Box will run on the Android 4.0 OSO based on the FONT OS 4.0. It has a 6.3 inch (1080x2280 pixels) full-view display 2.0. . Adreno 512 GPU is integrated for graphics. 6 GB RAM has been provided for Jugalbandi. Screen to body ratio is 90 percent in the display panel. Inbuilt storage of this phone is 64 GB and if needed, up to 256 GB MicroSD card can be used. Honor Play (4 GB, 64 GB)The Honor Play smartphone is available in Amazon Cell at Rs 17,999 (MRP 21,999). Honor Play will run on EMUI 8.2 which is based on Android 8.1 on this price. The smartphone has a 6.3-inch full HD + display and Octa-Core Huvaw is a Kirin 970 chipset that works in the phone and which is accompanied by the Mali-G72 GPU. Apple iPhone X 64 GBIn Paytm Mall the 64 GB variant of the iPhone X is being sold at an effective price of 70,699 rupees (MRP 95,390). Using the IPH16000 coupon code, you can get a cashback of Rs 16,000 in your Petty Wallet. Apple iPhone 8 Plus 64 GBThe iPhone 8 Plus 64 GB variant is available at PettyM Mall in an effective price of 60,300 rupees (MRP 77,557). Users can get a cashback of Rs 9,500 using the IPH9500 coupon code. Samsung Galaxy Note 9 128 GBIf you want, you can buy Samsung Galaxy Note 9's 128 GB storage variant at an effective price of Rs 61,900. NOTE9 Using coupon code, you can get a cashback of Rs 6,000 in your wallet.